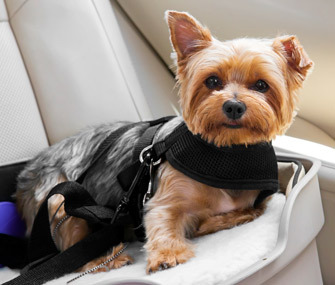 Make sure your pet is safely secured in the backseat of your car. According to a 2009 survey by AAA and Best Western International, more than three-quarters of respondents said they want to take their pet with them on vacation. We love our pets and want them to experience the excitement of exploring new destinations right alongside us. And with more and more pet-friendly accommodations available, it’s becoming easier to pack up the entire family for adventure. The key to traveling with your pet: planning! If you want to create a fun, hassle-free experience, do your research before you leave. These tips can help. Dogs and cats must have all required vaccinations to travel. Airlines and even some states require you to carry a signed certificate from your veterinarian documenting your pet’s health and vaccination history. When flying, check with your airlines well in advance to determine what’s needed to get your pet on board. Some airlines require that your pet’s health certificate be issued within 10 days of departure. Other carriers may ask for an acclimation statement when they can’t guarantee compliance with animal welfare regulations — like minimum temperature guidelines — while transporting your pet. These guidelines protect pets during their move from the terminal to the aircraft and in holding areas. It’s typically a concern during hot summer months or in cold locales. If you are asked to submit an acclimation statement before flying, work with your veterinarian to assess the potential risks of bringing Rex on board. The American Veterinary Medical Association website also recommends specific wording that owners can use to amend the document and help ensure safer transport. If you think your pet experiences anxiety while traveling, talk to your veterinarian about anxiety-easing medications and supplements, which may ease mild fears and calm nervous travelers. Your veterinarian may want you to test out these products before your trip to see if they produce the desired effect and to fine-tune the dosage. Sedating an animal for air travel isn’t recommended, because there is increased risk of injury and oxygen deprivation, especially for shorter-nosed breeds. Other options for keeping pets calm while in your care include compression garments and anxiety wraps, available for both dogs and cats, which offer a gentle way of soothing pets. Pet pheromones may also have a calming effect and can be spritzed onto the pet’s bedding area or diffused in a car or hotel room. Make sure the information on your pet’s ID tags hasn’t worn away and that you have the most updated information on them, including a cell phone number, since you’ll be away from home. You can also purchase temporary travel tags to provide supplemental contact information — like the name of your campground, hotel, or alternate residence — not imprinted on your pet’s metal tags. If your pet is microchipped, be sure to register with a national microchip registry, rather than just your local veterinary clinic. And if your pet doesn’t have a microchip, get one! Packing an updated picture of your pet in your wallet or suitcase will make finding, identifying, and returning a lost pet that much easier. 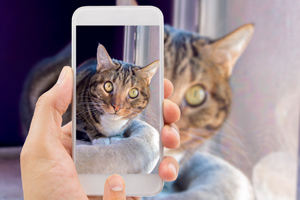 And keeping a digital photo on your cell phone will allow you to share your pet’s image in a flash. Even pet-friendly businesses may have limits on the number of pets allowed at their destination or on a particular mode of transportation. For instance, airlines limit the number of pets traveling in the cabin per flight. And certain hotels may have a limited number of pet-friendly rooms. It’s common for hotels to charge extra for pets. Just be sure to read the fine print, as some simply require a refundable deposit while others charge a nonrefundable flat fee. Also ask if there is a safe place to leave your pet if you have to step out alone. In addition, some hotels have restrictions on the type or size of pet (small dogs only, for example).